Despite the first significant winter storm of the season, enough players made the trek to CCFC to compete in our quads. NM Daniel Lowinger won the section with a perfect score. However the most impressive result of the day belonged to the youngest participant Vincent Xu who drew the much higher rated Vladimir Kotov. 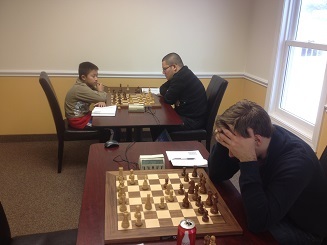 Vincent used a very tricky stalemate trick to survive a pawn down rook endgame!